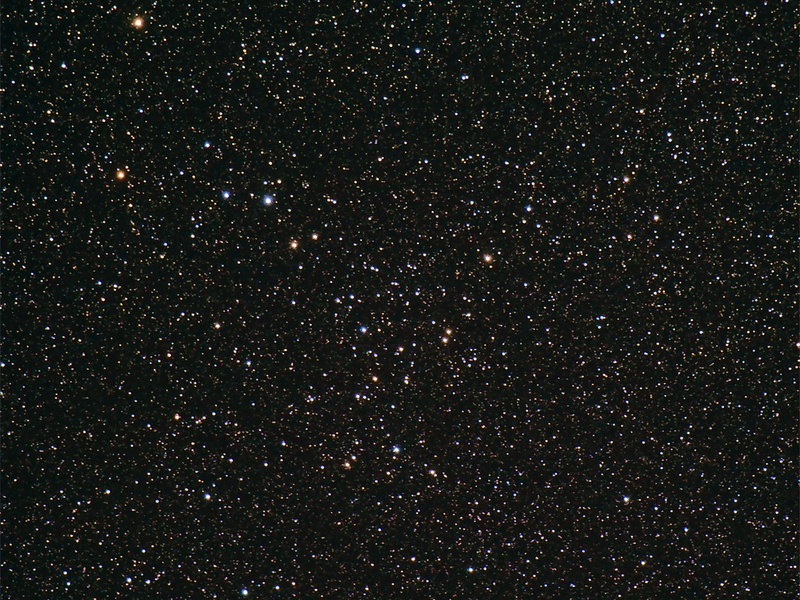 Ruprecht 147 (NGC 6774) is a mostly forgotten collection of stars in Sagittarius, cataloged and recataloged (thus the double name) for decades. It is visible with binoculars, and at least one astronomy handbook lists it as “probably an asterism” (that is, not a real collection of stars, just a chance alignment). Because it sits so close to the Galactic plane, where there are lots and lots of background stars to confuse the issue, and because it is so large on the sky, it has not been studied at all since its discovery and rediscovery. In 2005 some astronomers did an automated study of clusters and found that this forgotten cluster might be closest old cluster to the Sun. This is a pretty astonishing fact, if true. Many, perhaps most, of the stars in our Galaxy, including the Sun, form in large groups in giant star forming regions: massive clouds of collapsing dust and gas. The biggest stars in these regions can eventually get so bright that they disrupt the entire region, and the individual stars so formed remain in a loosely-bound collection. Over the span of hundreds of millions or billions of years they slowly drift apart due to Galactic tides and the effects of passing giant molecular clouds. Most stellar clusters are thus rather young, less than one billion years old. Massive clusters that manage to hang together for billions of years are rare, and the closest ones known are very distant (500-1000 pc away). Stellar clusters teach us a large part of what we know about fundamental stellar astrophysics, including how stars rotate, evolve, flare, and how bright they are as a function of their mass, composition, and age. We rely on clusters because all of the stars in a cluster were made of the same materials at around the same time, which lets us control for those variables. So it’s pretty amazing, and potentially extremely useful, that there could be a cluster more than 2 billion years old only 250 pc from the Sun. Such a cluster would be close enough that even its faintest stars would be bright enough to study spectroscopically with large telescopes. We could learn how low mass stars (from the Sun’s mass on down) behave in their “middle age” (the Sun is 5 billion years old, and will last another 5 bilion), and use the cluster as a template to identify stars of similar age that are not in clusters. In fact, that is exactly what Ruprecht 147 is. Graduate student Jason Curtis has recently determined that Ruprecht 147 is in fact the oldest nearby cluster, at about 2.5 billion years (maybe as old as 3.5) and about 250 parsecs away (maybe as far as 300). The announcement has even gotten some press coverage. This is a project I began at Berkeley using the Lick Shane 120-in telescope, and continued at Cornell with the Palomar 200-in (with Angie Wolfgang, now a graduate student at Santa Cruz), and now I am continuing this work here at Penn State. We have collected data from CFHT with Prof. John Johnson (now at Caltech), from MMT, from the FAST spectrograph on the Mt. Hopkins 1.5-m (with Dr. Steven Saar, CfA), and now have Chandra data with Dr. Saar, as well. We are also collaborating with Dr. Andrew West, who has provided Magellan data of the field. Ms. Wolfgang and Mr. Curtis have presented their work at AAS meetings, and Mr. Curtis has just posted a preprint of our paper, which has been submitted to the Astronomical Journal, to astro-ph.